When it comes to supermarket shopping, life should be a little easier for those looking for gluten free foods. This is because there are now increasing numbers of gluten free products appearing in the major stores to cater for increasing demand. 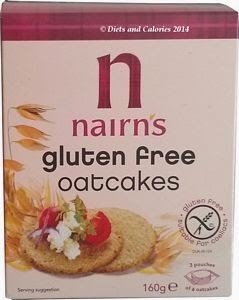 Nairn’s is one company who have added their own range of Gluten free oatcakes. Anyone living with a gluten intolerance has to maintain constant vigilance over their food intake, whereby ingredients have to be scrutinised before products can be purchased. Even a trace amount of gluten can be enough to trigger symptoms. Although oats are gluten free, there is still the risk of contamination if oat products are produced in areas where gluten is present. However, Nairn’s gluten free oatcakes have been grown in separate fields to ensure they remain free from contamination. Although I don’t have a gluten, or wheat intolerance, I wanted to see whether I could taste any difference between the regular Nairn’s rough oatcakes and the gluten free ones. Nutrition wise, Nairn’s gluten free oatcakes have 43 calories each, 2.2g of fat and 0.9g saturates. They’re made with 88% wholegrain oats. 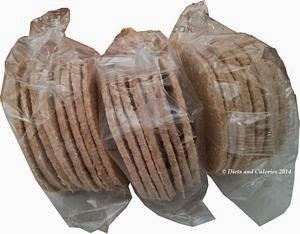 Nairn’s Rough oatcakes have 45 calories each, 1.8g fat and 0.9g saturates. These are made with 83% wholegrain oats. The main difference is the fat to oats ratio. The gluten free uses fewer oats and more fat, however, the calories are slightly lower. The gluten free oatcakes have a paler appearance, but otherwise look the same as regular oatcakes. When it comes to taste, I actually prefer the gluten free ones. I think it’s because they have more of a shortcake texture and I guess the extra fat helps. I also prefer the lighter bake. Oatcakes, while high in fibre, are high in fat and saturates. But this all helps to make them filling and satisfying. Other Nairn’s gluten free products include gluten free biscuit breaks, gluten free cheese oatcakes, gluten free herb & seed oatcakes, gluten free porridge oats and gluten free wholegrain crackers. At the time of writing, they cost £1.50 in Sainsbury’s for a 160g box. This contains three wrapped packs of seven oatcakes = 21 oatcakes in all! Nutrition information per oatcake: 43 calories, 1.0g protein, 4.6g carbs, 0.1g sugars, 2.2g fat, 0.9g saturates, 0.7g fibre, 0.05g sodium. Ingredients: Wholegrain oats (83%), sustainable palm fruit, oil, sea salt, raising agents (sodium bicarbonate, ammonium bicarbonate). Other information: Suitable for vegetarians and vegans. No GM ingredients. No added sugar (contains naturally occurring sugars). No artificial colours, flavours or preservatives. No hydrogenated fat. Contains sustainable palm fruit oil. Recipe is nut free but cannot guarantee ingredients are nut free. Not suitable for those allergic to the protein Avenin (a gluten-like protein, but usually fine for those with coeliac disease).